The basic premise behind gifting was to delight the receiver, and it was not happening. People are fed up with the conventional products which are exchanged as a gift, these gifts are either recycled and passed on, or remained unused. Identifying this gap, GiftXOXO came up with the concept of Experiences. Experiences are conceptualized with an underlying thought that everyone wants their special occasions like anniversary, birthday, first date, etc. to be an unforgettable day. We want to try different things like Flying a plane, Being a DJ, Learning cocktail mixing, Golfing, Horse riding etc. but to do these things we have to invest so much time and energy to arrange every bit of it and still get an unsatisfactory show. Frogo – B2C app that offers curated experiences across various categories from adventures to gourmet, tours & getaways to hobbies and much more activities. GiftXOXO – GiftXOXO uses SAAS solution for different functions like Rewards and Recognition, Employee Engagement, Employee Incentives for corporates. 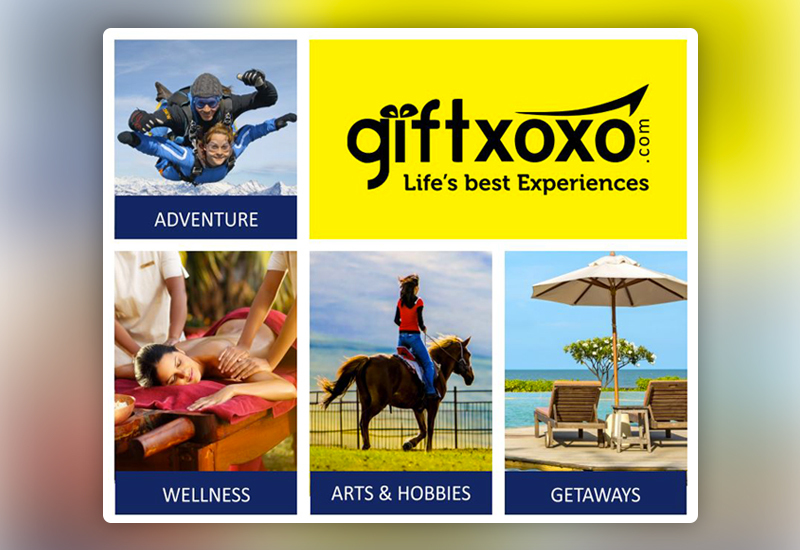 The redemption of these reward points is through GiftXOXO experiences and gift vouchers. XOXO Enterprise Lite – Automated gifting solutions, it’s as simple as uploading an excel sheet with email ids and send the gifts in just a click. With over 5000+ vouchers and end-to- end support, this is an apt choice for corporates. Kushal: He has worked with African FMCG major, BIDCO-Oil Refineries in Sales distribution and marketing. At GiftXOXO, he handles Sales and HR functions. Sumit: He has worked with Hexaware, Wipro Consumer Care, and METRO Cash; Carried in functions like sales, distribution, and marketing. He is responsible for business development, sales, logistics and finance at GiftXOXO. Abhishek: He has worked with companies which build technology solutions for Supply Chain, E-commerce, Business Intelligence, and Mobiles. He co-founded Evening Flavors, an e-commerce company. He manages engineering and technology at GiftXOXO. GiftXOXO was started in 2012 with only 25 clients, and their client base increased to 150 in a year’s time. And by the end of 2014, it reached 300, and by 2015 with the clientele of 400 they launched B2C app Frogo. In 2016, they launched XOXO Enterprise Lite for corporates, and currently, they have over 650+ happy clients. They majorly earn revenues through the commission from their service providers. They get revenue from both their B2B and B2C customers but currently it is more skewed towards B2B. However, they believe Frogo, will start contributing majorly from 2017. The other products like gift vouchers, rewards & recognition platform also contribute to the revenues. The company managed to achieve its target of closing the turnover of 39cr in FY16. Given the positive dynamics affecting the company, management believes they are well positioned to exceed INR 100 crore of revenues in the current FY. We had a discussion with Manoj, the founder of GiftXOXO and here is the summary of the discussion. First customers are very hard to find especially when your concept is very new in the market. After a long struggle, Kushal was finally able to meet the team from HCL. This was fairly new concept for them, however, we were able to convince them to get them to get on board to try out our product. Once they were on board, they asked us to run a pilot program of the Rewards for their Talent Acquisition Team. And we were only given 2 days to come up with experiences for HCL across all its offices. Our team moved between heaven and earth, worked day and night to come up with best experiences. Finally, they were happy to see the results and our dedication. The pilot project received great feedback, and since then HCL is our regular client and rest is history. As an entrepreneur, we wear many hats, but as the business grows, it is critical to identify which one of those hats need to be turned over to others so that we can scale the business. Challenges can be overcome only with time. I always reflect on the situation to figure out what can be done better and identify the cause of the problem. Once it’s identified, we discuss with our mentors and other partners and come up with a solution. We also went through a lot of research papers, spoke to other startup founders, took help from industry experts and also took help from our investors. Challenges are a dime a dozen when you have a startup. Everything from getting customers to managing the process can be a daunting task. There are uncertainties all the time, and one has to overcome them day in and out. I am from a family of entrepreneurs and have seen businesses from childhood. I have been on this journey for over 4 years now and it helps a lot when you have already seen this in your life. We have received seed funding from Kshatriya ventures, and we are in discussions with other investors for next round of funding. Our investors wanted to invest into a business who was in experiences and activities way back in 2012-13. They knew some of the big success stories in similar business outside India. When they realized that we are one of the leading experience gifting company in India, we connected, and it happened. Our investors have been very supportive and have mentored us on various fronts. Some of our B2B competitors are – O.C Tanner, BIWorldwide reward trunk, 7 Geese, Corporate rewards.co.uk, achievers.com, buyagift.com etc., however, none of these offers experiential gifting. In the B2C front, some of our competitors are – Cleartrip, Thrillophilia, NearBuy, bookMyShow etc. We try to be the best at what we do. Also, our pace of innovation is very high, most of our competitors have been in the market for more than a decade whereas we have got good traction in just 4 years. Our small yet powerful team is what gives us the competitive edge. Once people know that you deliver quality product and support, they will definitely come back to you. It’s all about giving the best to your customer, and other stakeholders and everything else will just fall into place. Start something after proper due diligence and research. Speak to as many people as possible about your idea. Primary research helps a lot; Refine, refine and refine your idea to suit the consumers need. Get your basics right in terms of creating real value for all stakeholders. Build the right product and focus on profitability along with scale etc. Spend wisely and raise funds only if it’s absolutely necessary.